Pax on both houses: John Kelly Called Rep. Frederica Wilson An "Empty Barrel." Is That Racist? 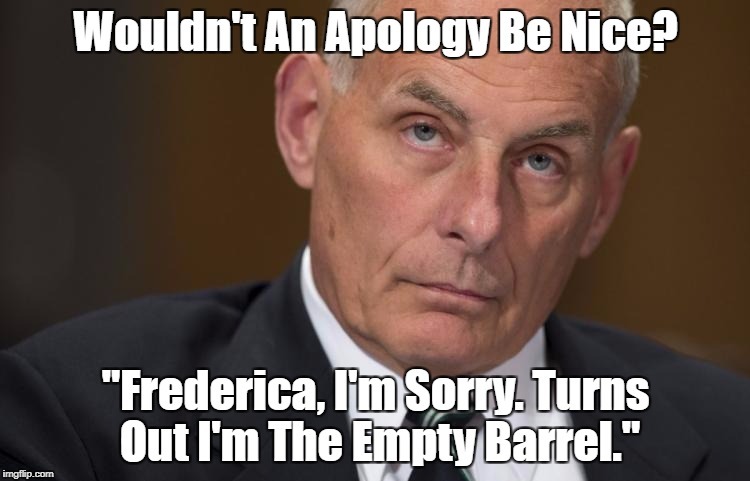 John Kelly Called Rep. Frederica Wilson An "Empty Barrel." Is That Racist? I hope Frederica stays in Kelly's face until, presumably, the general feels some shame. He still might be human enough to apologize. Sarah Huckabee said at today's press conf.that it's inappropriate to question a 4 star General. I thought the military was subject to civilian authority and to defend the constitution. Except the 1st Amendment? Kelly's feet are being held to the fire. His mischaracterization of the empty barrel (what does that mean anyway) Rep. Wilson taking credit for funding an FBI bldg. at its dedication. It was funded before she was even in Congress. The film was found and she was asked by the FBI to help get the bldg. named after a fallen agent. She approached and gave credit to Boehner and Rubio and others Congressmen for getting the bldg. named in time for the dedication. Talk about fake news but it was said by a 4 star General, so you can't question it.